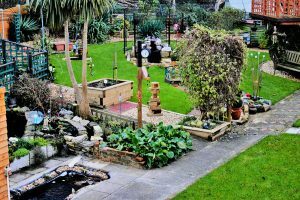 Ten tonnes of soil and 180m of turf have made John Simpson’s garden in Upwey, Weymouth, a paradise over the past year. Now he hopes his wildlife haven will make lots of money for Weldmar’s outstanding end of life care – as his garden was one of Weldmar’s Open Gardens in 2017. The engineer has created an amazing breadth of horticological interest in his back garden in Chapel Lane. There’s a stream running through the middle, ponds stocked with fish, newts, toads and other species. A ship-style gallery sprouts up in the middle, surrounded by blooms of every hue, and relaxing places to sit and watch the flora and fauna. Last year, John opened his garden numerous times for Weldmar, having found the support of our fundraising team to be a huge help. John’s garden, which also features a wall made of bottles, a wooden sculpture you can move round to create a design, a child’s ride-on toy and fruit and veg areas, stays open sometimes so that visitors can enjoy it in a whole different light; it is transformed at night into a wonderland, with coloured lights twinkling through the foliage. John likes to plant on a whim, preferring the garden to ‘evolve’ rather than plan planting schemes. The garden is so wildlife-friendly that trust staff often come to remove newts from John’s pond to establish colonies elsewhere. And they are very impressed at the grass snakes who have taken up residence. The microclimate in the garden means there are species in it not seen outside of Abbotsbury Sub-tropical Gardens in this area.